After much thought, consideration, and soul-searching-- I think it's time for me to give this whole thing a break. 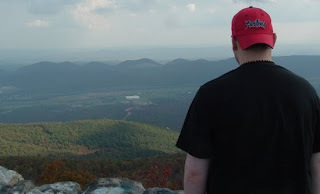 So, like many of my favorite bands, I've decided to put this blog on an "indefinite hiatus" and see how long it takes in order to get my feeling for this whole blogging thing back. Part of the reasoning for it has to be just the ideal that this has become more of a chore for me to do rather than an outlet to get my thoughts and stuff out. Due to personal and "professional" frustrations in my life-- it's better to actually let go of this for a while rather than beat myself up over not posting on a normal basis and not putting up stuff that I actually believe is good. Granted, none of the stuff I deem "good" ever gets the credit I think it should-- but that's probably me being too hard on myself through all of this. Thanks to the people who did read, link, and gave feedback on the stuff that I have written. It's always nice to get some kind of recognition for a hobby like this. Plus, the people I have met and interacted with because of this blog has been pretty cool, too. Not to mention the opportunities it has afforded me, it's been a crazy ride. I won't be completely gone, as my Twitter will live on in its randomness, as will Face Off Hockey Show every Wednesday (and on Facebook and YouTube). It's also not to say I won't create a new project and go on from there, but as it seems right now-- The Strangest One of All blog will lay dormant until something I feel is worthy enough to post here comes about. Take care of yourself and someone else. When it comes to goalies, it's always a rough task to come on in an emergency situation like an injury. Even worse back in the olden times when only one goalie dressed at a time as the concept of a back-up hadn't been invented as of yet. However, this week's AGM had the task of going in for, at the time, one of the most heralded teams in the NHL to that point with only an amateur background to boot. This week, the profile of Alphonse "Frenchy" Lacroix. Lacroix started off as a 16-year-old with Newton High School in Massachusetts in the 1914-15 season, going 5-1-1 in seven games, while in the 1915-16 season; Lacroix would post a 5-2-0 record. In his final high school season, Lacroix went 7-0-1 in eight games. Post-high school, Lacroix would play in the amateur ranks with the Boston Navy Yard in 1917-18 and posting a 7-4-0 record in a 11 games, as well as playing exhibition games for the Navy Yard in the 1918-19 season. Begining in the 1919-20 season until the 1923-24 season, Lacroix would play for the Boston AA Unicorns across different amateur leagues. Lacroix would go 15-4-0 in the 19 games played in that time-frame and 4-3 in seven playoff games. Playing in the amateur ranks allowed for Lacroix to be selected for the 1924 Olympics by the USA, where Lacroix went 4-1-0 in his five games played and helped the US to a silver medal. Lacroix would return to the Unicorns for the 1924-25 season, playing in 21 games and ending up with a 15-6-0 record. 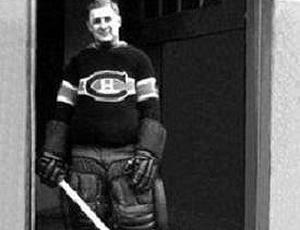 In November of 1925, the Montreal Canadiens signed Lacroix as an emergency goalie. When Georges Vezina started to cough up blood on the ice due to an undiagnosed tuberculosis; Lacroix would play in five games and going 1-4-0 before yielding the crease to Herb Rheaume for the duration of the 1925-26 season. Lacroix would spent the 1926-27 season under contract with the Canadiens, but not play a game with them that season. Lacroix returned to the amateur ranks, playing with the Providence Reds of the Can-Am League in the 1927-28 season, posting a 1-3-0 record in four games. Also that season, Lacroix played for the Lewiston St. Doms in the Northeast League and went 8-12-2 in 22 games played. Returning to the St. Doms in the 1928-29 season, Lacroix went 3-1-0 in four games, then 2-1 in three playoff games. Lacroix would return to the Can-Am League in the 1929-30 season with the Reds again, playing in only one games-- which was a win. In the 1930-31 season, the Boston Tigers would use Lacroix in net for four games, where Lacroix went 1-3-0 before he would retire after the season was over. Having to come into the NHL with no professional background and take over for a legend like Vezina is a taunting task for someone who actually had professional games under his belt. However, with a silver medal in tow and a decent amateur background-- Lacroix did what he could in the emergency situation. 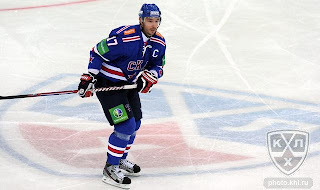 Kovalchuk Russian Back Home; Will Others Follow?? With Ilya Kovalchuk retiring from the NHL to return to the KHL, it not only shocked the hockey world in their reaction to it all, but it also made people question about if it was about being homesick or something more to it. While Kovalchuk could make $15-20 million a year, he did express interest in staying over in the KHL even after the lockout was resolved-- so the money may not have been the true issue. The factor of Olympics could be another factor, as the NHL and PA haven't decided yet on participation. This whole scenario could spring up a much more interesting conundrum in the future when it comes to Russian superstars. For a while now, the KHL has been an alternative for many minor league players and some players at the end of their careers. Yet, with Kovalchuk going over to the KHL in his prime age, would this be the thing that finally makes the KHL a viable option for other players to ship off to and maybe leverage their NHL team into contract demands?? Sportsnet's Jeff Marek did bring up the idea of Kovalchuk being the modern day Bobby Hull, though rather than bringing free agency into the NHL fold-- Kovalchuk's move could make many NHL teams force their hands and their wallets in order to keep their talent from jumping ship. Though many have reviewed the KHL as not well run, especially the lower tiered teams, if enough talent can come over-- the money will be found one way or another. Not only that, but with the league expanding into Croatia this season, as well as Finland and Italy in 2014-15 and Norway, Poland, and Switzerland for 2015-16; there should be a lot of money and a lot of variety to go around in terms of where some players want to play. Even if the top North American players don't go over, the role player threatening to go overseas could cause much overpayment to the players that won't live up to it and will make fans and pundits alike sweat heading towards this CBA's ending. Going the other way, the crop of Russians have hit a lull when it comes to those who have played in the NHL. Some of that is due to mismanagement, some of it due to not being the right fit; but you can definitely see that the likes of Pavel Datsyuk, Alex Ovechkin, and Evgeni Malkin aren't too much on the horizon. While the jury is still out on Nail Yakupov, it's probably safe to say that he could be the last of this generation to come over and have a bit of success in the NHL. With the KHL influence on the National players, it has made many NHL leery over selecting a Russian in fear that they may never come over, which is probably why Valeri Nichushkin dropped in the Draft due to his adamant feeling about playing in the NHL or else he'll go to the KHL to make the big money. That's also a reason why Evgeni Kuznetsov has stayed in the KHL, though the Caps are confident he could be over next season. That KHL money and the influence to the younger players that this is their league to take over when they get older and they should have pride in their national league, as much as the North Americans have with the NHL. As this whole thing will completely settle itself out, it does give a lot more to talk about than just development camps, lingering free agents, and upcoming arbitrations. Not only that, it makes some fans worry about what their top player could do with this development. Kovalchuk could be the first domino to fall or just the exception to the rule of Russian players. After a week off, the AGM this week focuses on a goalie who stayed to his amateur roots for longer than most in order to play in the Olympics. After that, he took another less taken road by going out west. This week, the profile of Don Head. Starting in the Junior B system with the Weston Dukes during the 1950-51 season, Head would move forward during the 1951-52 with the Toronto Marlboros for 37 games, winning the Dave Pinkney Trophy for goalie with the best goals-against average for his team. Head would return to Weston for the 1952-53 season to end out his junior career. Going the amateur route with Senior Hockey, Head played for the Stratford Indians from the 1953-54 season until the 1955-56 season, playing in a total of 74 games over that span. Head moved to the Windsor Bulldogs in the 1956-57 season, where Head would go 30-17-3 in 50 games, six wins by shutout. During the 1957-58 season, Head moved to the Chatham Maroons of the Northern Ontario Hockey Association and would play there for two seasons for a total of 96 games. Returning to Windsor for the 1959-60 season, Head used it as a tune-up for his role for Canada in the Olympics. Head would pilot the Canadians into a solid position in the Olympics, going 5-1-0 in the seven games he played in, but they were upset by the United States, relegating the Canadians to take silver. 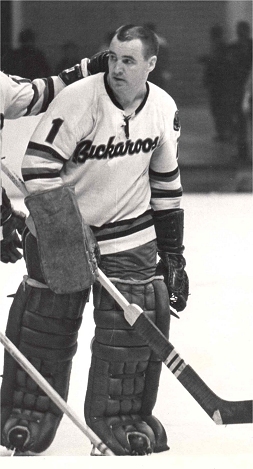 Starting in the 1960-61 season, Head moved onto his pro career with the WHL's Portland Buckaroos, where Head went 38-23-9 in his 70 games, then going 10-4 in the playofs to help Portland to the WHL title-- the Lester Patrick Cup. Head would win the WHL's Rookie of the Year award and Outstanding Goaltender Award for fewest goals-against on the season. Portland would trade Head to the NHL's Boston Bruins ahead of the 1961-62 season, where Head would play in 38 games for Boston, posting a 9-26-3 record. Head would also spend five games in Portland that season on loan, going 3-1-1 in those games. The Bruins traded Head back to Portland before the 1962-63 season, where Head would rebound from his NHL downside with a 43-21-6 record in 70 games, then 3-4 in the playoffs-- which was enough for another Outstanding Goaltender Award. Injuries hampered Head for the 1963-64 season, playing in only 16 games and having a record of 6-9-1; but Head would get back to play a majority of the games for Portland in the 1964-65 season, posting a 26-20-4 record in 51 games played, then 8-1 in the playoffs; helping Portland to another Lester Patrick Cup as champions. Head's workload would decreased starting in the 1965-66 season, playing in only 36 games and finishing with a 20-12-3 record, sharing an Outstanding Goaltender Award with teammate Dave Kelly. During the 1966-67 campaign, Head played in 44 games for Portland, going 26-13-5, then 0-3 in four playoff appearances. Portland traded Head to the Seattle Totems before the 1967-68 season, where Head would go 23-19-4 in 46 games and then posting an 8-1 playoff record to help the Totems to the Lester Patrick Cup, the team's second in a row. Back for the 1968-69 season, Head played in 44 games for Seattle and compiled a record of 22-13-4 (0-4 in the playoffs), while in the 1969-70 season; Head went 8-10-2 in only 20 games with the Totems. The 1970-71 season would turn out to be the last for Head, going 4-7-3 in 16 games before he would hang up the pads for good. Head was inducted into the Oregon Sports Hall of Fame thanks to his time and achievements with the Buckaroos. Though he had a cup of coffee in the NHL (which resulted in a Sports Illustrated cover....sort of) and Olympic glory, Head's contribution in the the semi-pro side of things made him a memorable aspect of Pacific Northwest sports lore. Though it might not be the big time for most, Head make the most of it and succeeded quite well due to it. At the end of the day, you cannot blame Daniel Alfredsson. The emotion of everything that has happened today with the news that Alfredsson is leaving the Ottawa Senators for the Detroit Red Wings; the thing lost in all of this has to be the idea that with the departure of Alfredsson, they actually need to have someone pick up the pieces for contribution. It's a time for Jason Spezza, Milan Michalek, and the other players to step up their game and hopefully find a way to stay healthy in order to contribute more. Not only that, the void left in the locker room for the Senators is something that won't be as easily replaced as the scoring contribution. For a core of young players, it's a huge hit in trying to turn to someone, but for guys like Erik Karlsson, it will make them grow up a little more and actually learn to become a leader and get the experience by being fed to the fire. Not only that, it'll be a big thing for Paul MacLean to be the motivator that he has shown off to the world with his Jack Adams Trophy campaign this past season. Yet, the biggest sign this signing to Detroit brings is that Alfredsson doesn't believe himself to be the primary contributor to the Ottawa Senators, as he was being called upon to do. Getting up there with age, it just shows that Alfredsson is at the point of his career where he wants to be able to ride shotgun and let the others actually be the superstars of the team and he can lay back and be the secondary scoring and the leader on the ice by example. With this, the Red Wings will get some experience they have lost in the past few years with the retirement of Nicklas Lidstrom, Kris Draper, and the like. Alfredsson's voice is something that's respect around the league and is someone who could teach Henrik Zetterberg how to be a leader off the ice, as well as on. Sure, the teaching of that is often futile, but if Zetterberg is willing to learn a thing or two from Alfredsson; it couldn't hurt to get some pointers here and there. Plus, they get a little bit of consistency out of Alfredsson, who won't bring big goals or assists; but all of his points are very timely and will add more punch to the second power play unit, especially on a big one-timer chance. While it may not completely fill the void and drop-off from Zetterberg and Pavel Datsyuk's points contribution; Alfredsson could give a shot in the arm to the top-six guys. Most importantly is what the fans of the Senators will do when they meet their new division rival Red Wings this season. They will be mad, regardless of what Alfredsson says his reasons are for leaving Ottawa. The wounds of this signing is going to be hard to make heal with time or at all. 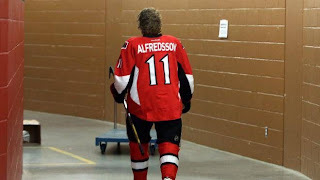 I'm sure long after Alfredsson has retired, he will be welcomed back by the Ottawa faithful as Mr. Senator-- but for now, there's bitterness, tears, and a lost feeling trying to find out what went wrong between the Sens and Alfie.